With our affection training methods & positive reinforcement we get the results you want in a happy and safe environment. Safety for the crew and animals is our number one priority! For over 30 years we have dedicated ourselves to maintaining the highest safety standards and animal care in the film industry. We provide free budget & script breakdowns by our animal coordinators & work closely with your production, providing professionally trained animals within your budget. Our ranch is centrally located in the Santa Clarity Valley, just 30 minutes from Hollywood, CA, and is available as a location. Hollywood Animals Inc. is fully insured and a licensed exhibitor and permitted worldwide by: USDA, US Fish and Wildlife, CITES, CA Department of Fish & Game, Los Angeles City Animal Regulation, Los Angeles County and APHIS. Leaving behind a four year career on Madison Avenue in advertising, Eric embarked on a new adventure: Hollywood Animal's, Animal Husbandry and Training Course. Amassing from their school a foundation of knowledge on safety around exotic animals, necessary husbandry for these creatures, and the day-to-day hard work ethic needed for this occupation. Eric joined Hollywood as an intern. Mucking out the elephant barn, giving Nellie baths and watching Brian work with his exotic animal actors. Eric knew this jungle was better than the urban jungle of New York. Brian McMillan's training methods and positive reinforcement meshed with his own ideologies. Eric became a partner with Brian and Vikki McMillan in 2004. 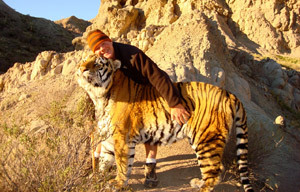 Eric has since been an intricate part of the company both on the set training the animals, and meeting with clients and has brought a new exciting approach to Hollywood Animals' expansion. As an undergraduate at USC, she studied anthropology with an emphasis on primates and considered moving to South Africa to be a safari guide. But instead, she finished her degree and tried such endeavors as gallery work and fashion styling before answering the call of the wild. "I met my husband, Eric Weld, and he had just gotten into exotic animal training," she said. "I thought, 'Ah, that's what I want to do, too.'" 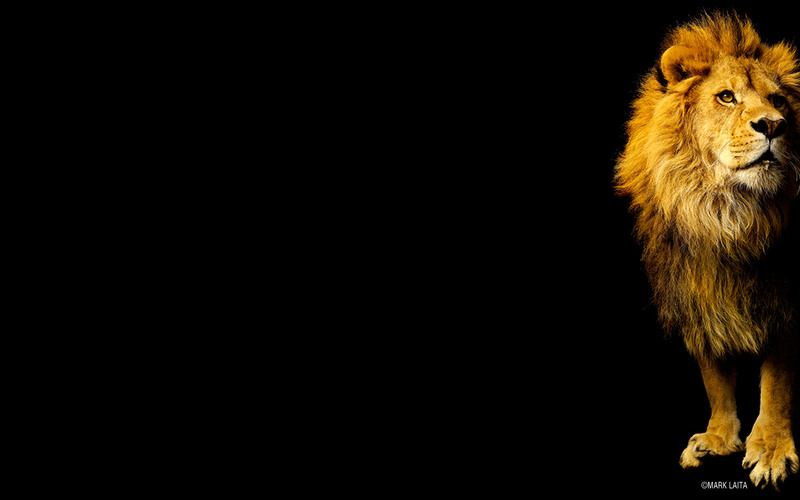 On her first job, she trained 7-month-old lion cubs for a Whiskas commercial. But the first time she ever worked with a full-grown male lion — a 550-pound creature named Felix — was on 2007's "Prey," which she considers the biggest step in her career. Since then, Browne has trained animals of all sizes for films including "Step Brothers," "Angels & Demons" and "Zookeeper," but she saves the lion's share of her love for the big cats. 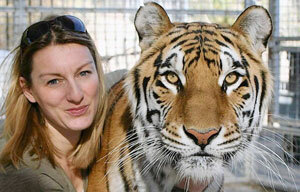 "Maybe it was from watching 'Born Free' when I was younger, but the big cats are really my first passion," she said. "I always have to step back while I'm working and just be amazed at the fact that I'm on leash, or I'm working a tiger or a lion, and I'm just loving the relationship that I can have with them."